Lok Sabha Elections Latest News: “After seeing this sea of saffron, I now know why Pawar fled from the poll arena,” said PM Modi while addressing a rally in Madha, Maharashtra. Interestingly, NCP MP Vijaysinh Mohite Patil shared the stage with PM Modi during the poll rally. 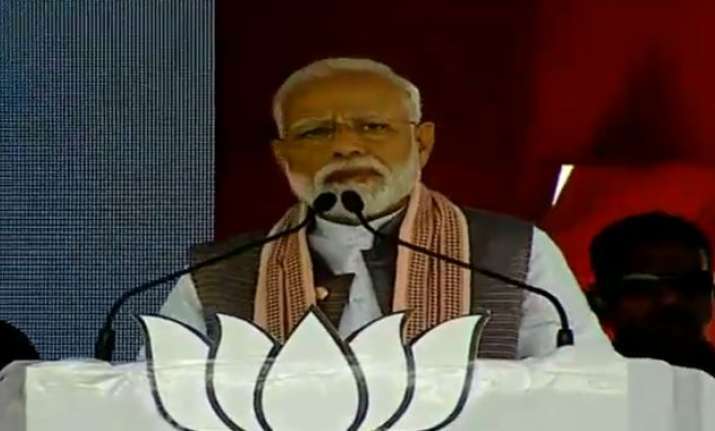 Lok Sabha Elections Latest News: Prime Minister Narendra Modi on Wednesday took a jibe at Sharad Pawar and said because of the popularity of the Bharatiya Janata Party (BJP), the Nationalist Congress Party (NCP) leader fled from the poll arena. “After seeing this sea of saffron, I now know why Pawar fled from the poll arena,” said PM Modi while addressing a rally in Madha, Maharashtra. Interestingly, NCP MP Vijaysinh Mohite Patil shared the stage with PM Modi during the poll rally. PM again reiterated that for running a big country like India “you need a strong leader”. “Those sitting in Delhi in AC rooms & keeping a tab on things which will happen after who hugs whom, after who shakes hands with whom, after who looks at whom, they don't know the ground reality,” PM added. He also attacked the Congress government during the rally. “Congress can never give strength to the nation, only Modi can,” PM roared.